This page provides security information for Windows users. For general information on security measures and precautions, please refer to the Security Tips page. 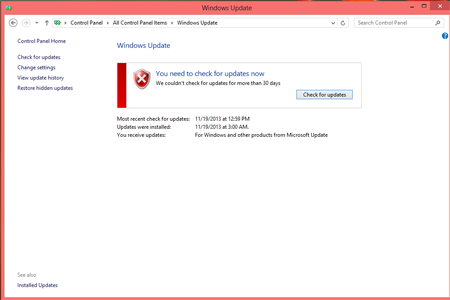 From the Start menu, select Control Panel, and then Windows Update. The Windows Update window displays. Note: The Windows Update screen will vary slightly depending on which edition (Home, Ultimate, or Enterprise) you are running. and then Windows Update. The Windows Update window displays. Press the Windows key on the keyboard or click the Windows button on the bottom left-hand corner of the screen. In the box that appears, start typing control panel and click the first option that appears. In the Control Panel, select Windows Update. The Windows Update window displays. Before you connect your computer to the USC network, you should make sure your computer has the appropriate patches installed. See Windows Security Patches. Microsoft Baseline Security Analyzer is a program that verifies that all of your computer updates are current and that there are no security flaws. ITS recommends only running the program on the computer that needs to be scanned. The Windows operating system is designed to work within a networked environment. The Windows operating system has built-in, server-level services that cannot be turned off. To protect your computer, you must run a firewall. ITS recommends that users with computers running the Windows Vista, Windows 7, and Windows 8.1 operating systems use the firewall that is built into these operating systems. See the Windows Security page for instructions on how to turn on the Windows firewall. From the Start menu, select Settings and then Control Panel. Make the Windows Firewall screen says Windows Firewall is On. Note: If On is not selected, your security definitions are already outdated, and you should download the most recent service pack available for your operating system at the Microsoft website. Choose Turn on Windows Firewall from the menu on the left side of the screen. Close the Windows Firewall screen when you are finished. From the Control Panel, select System Security and then Windows Firewall. Make sure Windows Firewall state is listed as On. 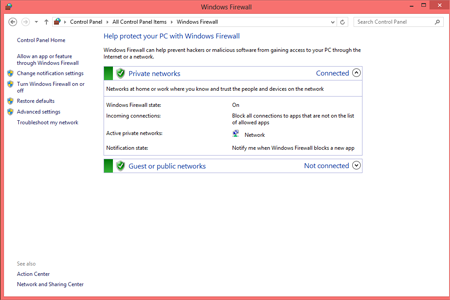 Select Turn on Windows Firewall for both Home or work (private) network location settings and Public network location settings. From the Control Panel, select Windows Firewall. For detailed information on Windows Security, see the Microsoft TechNet or CERT website. The ITS Customer Support Center provides support for software available on the software download page. For help with other programs, contact the software’s vendor or go to the vendor’s website.